Whilst at University I spent a summer working in a farm house on a country road called Christmas Pie lane. There I was armed with a glue gun sticking baubles onto garlands and Christmas trees, which would then be displayed in high streets up and down the country. During my visual merchandising career we would start planning Christmas window schemes in July with Christmas songs playing while drinking ice lattes in the studio. I love the run up to Christmas. So I always feel a little late when decorating my home in December. I love clean lines and simple interior design, however this all goes out the window at Christmas. My tree is full of hand made felt or knitted decs, I love monogramed miniature stockings, bespoke gift tags from the lovely Fraser and Parsley or beautiful white ceramic baubles with our names in metallic. You can’t beat the personal touch at Christmas. I’m a real Christmas tree girl. However, I also like my tree up on the 1st December thus ensuring all my decorations are on the floor come the big day with a very sad dead tree in my bay window. This year I purchased a *whispers* faux Christmas tree. It took me longer to dress as I became obsessed about angling the branches like a real tree. The benefit is I can display the heavier decorations without worrying that they will fall off and it will still look great on Christmas Day. The trick is to invest in a very good faux tree which looks real and spend the time playing with the branches and make sure it is not too uniformed. However, I do keep smelling the real Christmas trees in Wimbledon Village High Street as I walk by and ‘pine’ for a real tree. If something stays still long enough in my house it will end up draped with fairy lights. There is something magical about fairy lights, bistro lights and scented candles this time of year, in fact any time of year. I was a little thrown this year as my lights had broken and it seems you can only purchase LED lights now. My golden rule with lights at Christmas is it has to be soft glow lights and you always need a little more than you think. I have a 7ft tree this year and 400 lights look perfect. More than that and I would not have been able to see the tree or decs. Use a green string of lights on the tree so it is hidden but a clear string if you are draping around frames, mirrors or plants or family members if they stay still long enough. 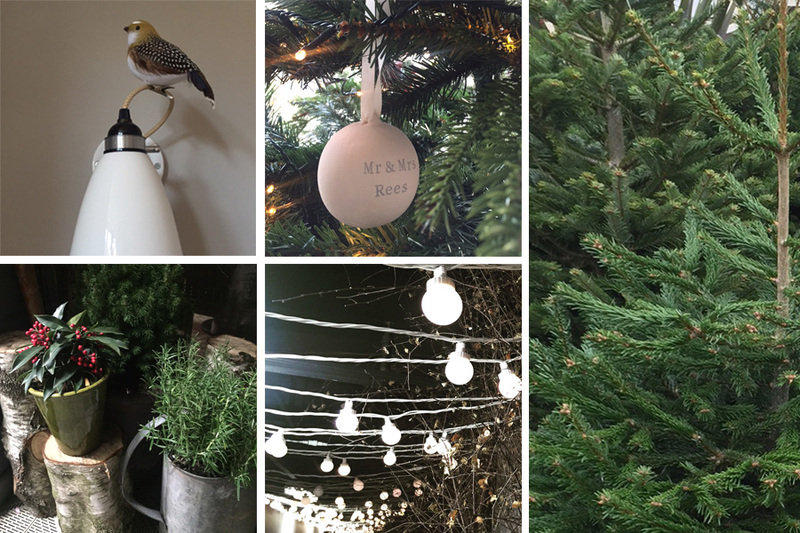 You can’t beat a little winter foliage to complement the metallic baubles and tinsel. I suggest using eucalyptus and foliage from your garden such as ivy, holly and rosemary. It creates a wonderful woodland feel and an amazing scent without spending the big bucks. Take the kids on a walk to forage for foliage. They will love being a part of it and making table decorations or a Christmas wreath. We always collect pinecones in the autumn and fill vintage glass vases and hurricane lamps with them. Try grouping them into 3s and dot them over the tree. Always dress the tree with pinecones or decs in odd numbers. 3’s and 5’s work best. I love giving my clients a small gift at Christmas to say thank you. Last year I gave clear bauble and filled them with chocolates, tied them with a simple bow and a Nikki Rees stamped gift tag. This year I found the cutest miniature brown paper bags, popped a little scented white candle inside and stamped the tags again. It’s just a little gift that I hand deliver. It also doubled up this year as gifts for my son Jack’s school friends. You don’t have to spend a lot it, just needs a little thought and a personal touch.